Are Headaches and Dizziness Related? Dizziness and headaches are often accompanied by each other, and it can sometimes be hard to tell if one is a symptom of the other. It is possible to experience these sensations separately, or indeed with other complaints such as nausea or lightheadedness. For this reason, it is hard to define the relation between feeling dizzy and having a headache because they may not always be present simultaneously. Understanding some of the main triggers of these maladies can be useful when trying to determine if one is a cause of the other in any given circumstance. Motion sickness. Some women are more prone to suffer from this than others, but it is fairly common for the movement of boats, cars, planes, or other modes of transport, to cause some passengers to feel unwell. Depending on your personal disposition, you might experience nausea or even vomiting, as well as dizziness and headache. Stress and anxiety. Many women find that they are affronted with a headache when they are experiencing stressful circumstances, or if something in their personal life is causing them anxiety. Depending on the severity of the situation, dizziness may also occur at this time. Strong fragrance. Heavy scents such as those exuded by perfume, cleaning products, and chemical-based toiletries can sometimes cause headaches. If you are particularly sensitive, or the smell is strong enough, it may also lead to nausea and dizziness. Nausea. Most of us will experience nausea at some point during our lives, and this can often go on to trigger dizziness and headaches. It can happen for a number of reasons, varying from motion sickness, fevers, and food poisoning among others. Becoming over-heated. Some women are susceptible to feeling dizzy and developing a headache if they are over heated - this can be especially common among menopausal women, when they suffer from hot flashes. It can also occur when you are exposed to warmer climates than you are used to. Poor diet or dehydration. The recommended amount of calories per day is 1800-2200 for an adult female, and intake of fluids is six to eight glasses. If these are not adhered to the body will struggle to function properly, and you could experience dizziness, headaches, fatigue, and nausea. 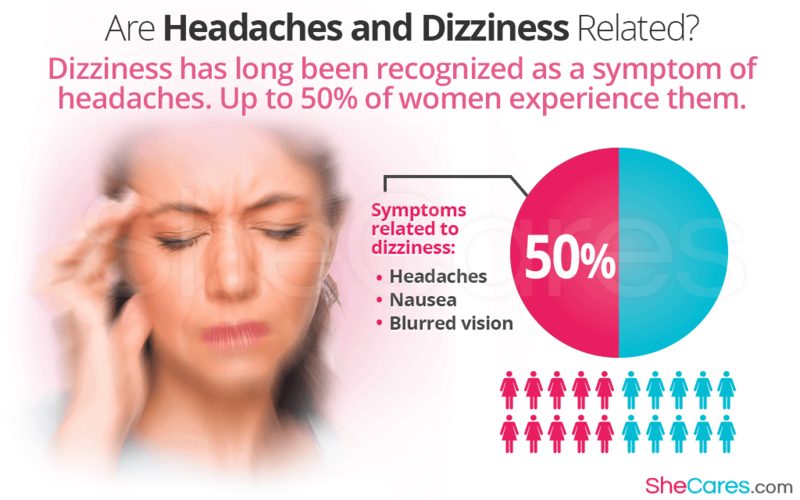 Dizziness has long been recognized as an accompanying symptom of headaches, between 20-50% of women experienced them. Poor balance and blurred vision are other symptoms related to dizziness. Brain and ear tests are appropriate for patients suffering from severe dizziness and headaches. Although it is possible to encounter headaches and dizziness individually, in many cases when they are apparent, they will lead to not only the other, but also additional unwanted symptoms - the most common being nausea. If you find that this is a common event for you, it should be reassuring to know the reasons why this could be in order for you to treat or even prevent the situation. For more information about causes and treatments of headaches, click here.